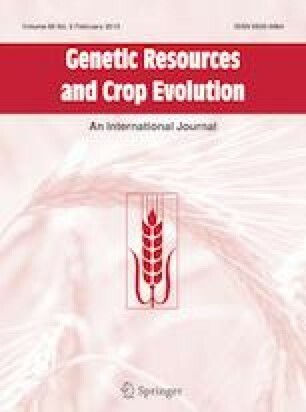 Five microsatellite (SSR) markers were used to evaluate the genetic diversity of six Aegilops species from Azerbaijan and Georgia. A total of 39 alleles were generated with an average of 7.8 alleles per primer. Twenty markers were species-specific and 6 were accession-specific. The transferability of SSR markers across six species was 100%, with exception of gwm210. The mean polymorphism information content (PIC) and expected heterozygosity (He) values for the entire collection were 0.688 and 0.725, respectively. The average PIC value was the highest in Ae. biuncialis accessions (0.55). The genetic distance (GD) indices, based on five SSR markers, ranged from 0 to 0.83, with a mean value of 0.47. The highest genetic similarity was noted between Ae. neglecta and Ae. triuncialis (GD = 0.26), and the lowest between Ae. neglecta and Ae. tauschii (GD = 0.66). The dendrogram created based on SSR data grouped 72 Aegilops accessions into six clusters according to their taxonomic classification. The accessions from the same province were often placed in the same subclusters, indicating that grouping based on genetic parameters was closely related to the geographic region within countries. The PCoA analysis could differentiate Aegilops accessions according to their species and confirmed subgrouping obtained by cluster analysis. Funding was provided by Norman Borlaug Fellowship, Fulbright fellowship.